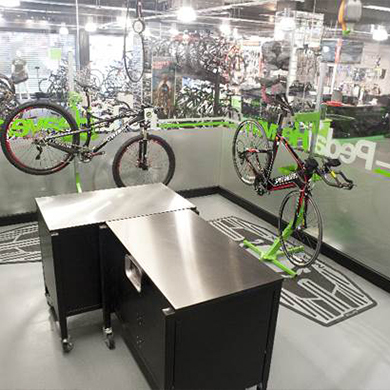 Having your bike serviced or repaired in a small cupboard, out of sight, in the back of a shop is a thing of the past. We realise that all customers need the confidence and assurance that their beloved bikes are always being looked after, by qualified professionals that always take pride in work undertaken. Our state of the art service centre is one of the most up to date and cutting edge workshops in the UK, employing the most highly trained, skilled and sought after mechanics in the area. At Pedal Heaven we pride ourselves in offering the highest quality of work at a very competitive price. All of our mechanics have been trained to the best levels achievable (Cytech level 3) and are always keeping on top of all new products and technology in order to keep up with the market demands. You can be assured that any bike left with us is in the best hands possible, the same hands that have worked on one of the most successful, professional cycle teams. We offer a free and thorough bike assessment before any work has started to keep our customers informed with the correct costings. We pride ourselves in achieving a very fast turnaround of bike service and repair so that you will not miss out on valued time in the saddle.